Ms D was injured when she fell into an unmarked and exposed excavation in the pavement. 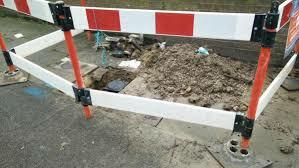 When our Lawyer took on the case it transpired that utility works were being undertaken in the area and barriers surrounding the excavation had not been erected. A hole of this size (approximately 3 foot deep) should have been properly boarded up and precautions taken to prevent accidents like this. Temporary barriers are frequently subject to vandalism or are blown over in high winds. Mrs D. received £1,750 in compensation for the injuries resulting from the accident. This article was added on Wednesday, April 15th, 2015 at 5:04 pm and is categorised under . Both comments and pings are currently closed. Error: Error validating access token: Session has expired on Saturday, 09-Mar-19 13:12:58 PST. The current time is Thursday, 25-Apr-19 10:07:01 PDT.